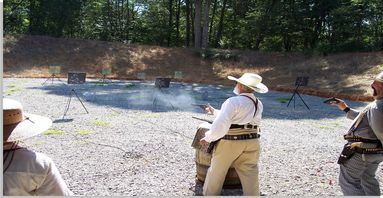 Cowboy Action Shooting is a safe, fun, family oriented competitive shooting sport for folks who enjoy shooting Old Western era type single action firearms. You can step back in time or step onto the silver screen and be a cowboy/cowgirl for the day. The Oak Ridge Outlaws are an authorized and fully affiliated sub-club of the Oak Ridge Sportsmen's Association. Our club follows all the rules of the Single Action Shooting Society (SASS) except that we allow one reshoot per match for a gun/ammo malfunction and shooting a round over the berm is a match disqualification. We are a very friendly group of folks and we love to introduce new people to our shooting sport. Come out and watch a match! Remember that eye and ear protection is required - so bring your ear plugs and safety glasses. Before you participate in your first cowboy match, we recommend that you attend a New Shooter Orientation (if you can) so that you will be familiar with our procedures. Go to the Contacts page to request an orientation or join our Forum and introduce yourself. Sign-in begins at 8:30am and we begin shooting after a safety briefing at 9am. We shoot five or six stages at this match (Check the Forum to be sure). Fees are $15 ($10 for members*). Kids 16 and under shoot free. This match is on a "weather-permitting" basis. Check the schedule here several days in advance to make sure it is still on. We shoot six stages at our mid-week match. Fees are $5 (kids 16 and under shoot free).